A miserable adaptation of a dull play, The Grass Is Greener is a hopelessly dated mostly unfunny romantic comedy set in an English estate. 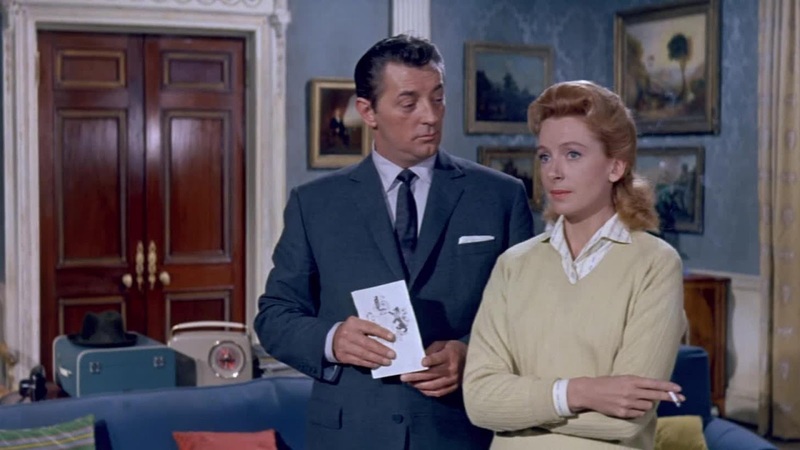 Victor, Earl of Rhyall (Cary Grant) and his wife Hilary (Deborah Kerr) have had to open their English countryside estate to tourist traffic in an attempt to make ends meet. Their only other source of income is a modest mushroom farming operation. One day American oilman millionaire Charles Delacro (Robert Mitchum) barges in on Hilary in the private section of the house, and after five minutes of banter they fall in love. Hilary contrives a trip to London and spends a few days with Charles, enjoying a whirlwind affair. But Victor will not give up on his wife without a fight, and with the help of his former girlfriend and sharp-tongued society girl Hattie Durant (Jean Simmons) concocts a plan to invite Charles to the estate to defend the honour of his marriage. It's difficult to imagine that The Grass Is Greener was ever current or funny, either on stage or on film circa 1960. As directed by Stanley Donen, this is a stilted, witless, stage-bound and endlessly talky comedy of British manners that would have appeared old in the 1940s. The four stars are utterly wasted, the script not finding any genuine passion or plausible pretexts to create neither appealing drama nor dreamy romance. Grant, Kerr and Mitchum fire off their lines with little conviction while Simmons parades around in a succession of Dior outfits and provides some spark, but too little and too late. At least the set design, and most of the film is in one room, is understandably lavish and colourful, given the setting. The script by Hugh Williams and Margaret Vyner (who wrote the play) tries to make some intelligent commentary about the institution of marriage, and throws in some remarks about the differences between British and American sensibilities. Very little of it works or rings true, as the endless scenes drag on in a remarkable display of more is less, not helped at all by lazy and static directing from Donen. The Grass Is Greener just turns into a sickly brown all over.